Sequential measurements and documenting abnormal trends in flow rates or velocities over time may be helpful in identifying those access sites that should be considered for intervention. 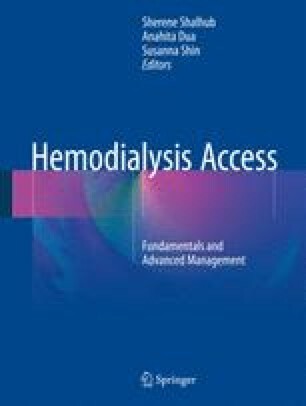 The Society for Vascular Surgery (SVS) clinical practice guidelines recommend “regular clinical monitoring to detect dysfunction” of dialysis access sites and “performing a duplex ultrasound study or contrast imaging study in accesses that display clinical signs of dysfunction or abnormal routine surveillance.” A baseline duplex ultrasound assessment of a new access site prior to first use for dialysis is valuable to verify adequate volume flow and conduit anatomy. With appropriate training, ultrasound screening for access site maturation can be performed as a “point of care” test, with referral to the vascular laboratory for a complete duplex examination when abnormalities are detected. This chapter focuses on duplex examination timing and technique in hemodialysis care.